Online interactive presentations available at no cost . 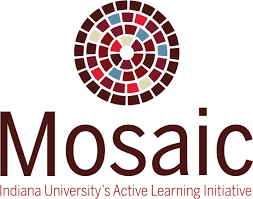 With more than 60 Mosaic classrooms across the IUPUI and IU Bloomington campuses, the Mosaic Initiative is leading a growing movement supporting active learning. Participants in the Mosaic Faculty Fellows program are studying how these spaces support active learning, and will present their findings and answer questions in the Mosaic Faculty Research Webinars. Anyone interested in active learning at IU is welcome to join the no-cost webinars. They will also be available for viewing after the event. 9/20—Are teaching assistants effective in facilitating group work in active learning classrooms?